Your health team should state which of these apply. If you are on a fixed dose insulin therapy, your doctor or diabetes health team will help you to pick the dose, or doses, which you need to take each day. If your blood glucose levels are running either too high or too low, contact your health team who will be able to help you make any dosage adjustments as appropriate. Check what the recommended sugar levels are, referred to as your target blood glucose levels. 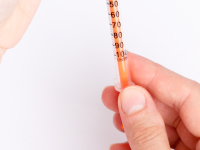 If you are on a flexible insulin therapy, you will need to inject an appropriate dose to ensure your blood glucose levels don’t go either too high or go too low. When you start on insulin, your diabetes team should give you guidance on how much insulin to take. Insulin requirements will typically vary from meal to meal and can be influenced by a variety of factors - see below for more information on these factors. Blood glucose testing will play a useful role in helping you to judge how much insulin to take. People on a flexible insulin therapy should test their blood regularly to help support dosing decisions and to help prevent hypoglycemia. What factors affect insulin dosage? The more carbohydrate you eat, the more insulin you will need to take. When we are active, the body requires glucose to fuel our muscles and this can cause blood glucose levels to drop either during or after exercise. Exercise increases sensitivity to insulin for up to 48 hours and may require a reduction to insulin doses. When we are ill, our body will typically raise our blood glucose levels. During periods of illness, we will likely need to take more insulin than usual. Typically, the bigger you are, the more insulin you will require. Children with type 2 diabetes, for instance, will likely find that their insulin requirements steadily increase as they get older. This is a characteristic of type 2 diabetes. A larger resistance to insulin will mean that more insulin will need to be injected to achieve a reduction in blood glucose levels.